Later this month, 30 of France's elite will rock up at Marcoussis for Philippe Saint-Andre's first squad session of the season. Nine of them will have travelled up to the capital from La Ville Rose; rugby's premier city; the home of Stade Toulousain; the Rouge et Noir; Guy Noves' children; a club whose stadium has a brasserie where most rivals have a burger bar, and which scrapes by on the biggest budget in world rugby. Toulouse have won the French Championship 19 times and are in the process of attempting to qualify for what would be their 21st consecutive semi-final. Yet on Sunday, with all nine of their current France squad members on show, they were pummelled 25-0 by Montpellier. Nilled for the first time since Toulouse-Lautrec held a season ticket at the Ernest Wallon. Well, probably. But how does that happen when almost half of your team makes up one-third of the France squad? Easily, because having so many France internationals on the staff - even one backed by a 35million euros budget - isn't necessarily a good thing. "Progressively more restrictive regulations on player recruitment demanding a higher percentage of players are eligible to play for France has seen clubs like Toulon head for the Pacific islands to spot talent." Noves even said it himself in the immediate aftermath of their semi-final elimination by Toulon in Nantes in May. The man dubbed rugby's Sir Alex Ferguson - he's now in the 21st season of his second stint in charge at Toulouse - admitted the club's recruitment method is flawed. "The policies of other clubs have forced us to review our own," Noves said. "Toulon, Montpellier, Racing and Stade Français are recruiting world-class foreigners. "We've got France internationals who we expect to perform all year round but we are up against players who only play for their clubs and are fresher. We'll have to stop recruiting France internationals and get top-class foreigners instead." That, put in in crude terms, is how Mourad Boudjellal has stocked up Stade Mayol: Wilkinson, Giteau, Botha, Hayman, Sheridan, the Armitages, Masoe - all capable of performing at, or close to, Test level but all of them excluded from international duty for one reason or another. Yet the European champions have also demonstrated a more street smart method to recruitment which involves more than the comic strip billionaire resorting to the power of his chequebook. Progressively more restrictive regulations on player recruitment demanding a higher percentage of players are eligible to play for France has seen clubs like Toulon head for the Pacific islands to spot talent. Wing Josua Tuisova is still a teenager and only arrived in Toulon in July yet he's already made his Top 14 debut. Credit for Tuisova's emergence goes to former prop, and now Toulon academy manager, Laurent Emmanuelli. Mind you, it is probably no coincidence that the bulk of Emmanuelli's playing career was spent in volcano country where Toulon's bitter rivals were swiftest out of the blocks when it came to spotting the benefits of investing in the Pacific islands. Clermont Auvergne have their own academy in partnership with the Nadroga club. In return for providing facilities and expertise as well as the opportunity for Fijian coaches to spend time in France on exchange programme, every now and again Les Jaunards unearth an unpolished gem. 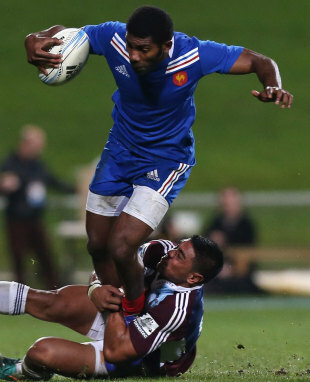 Noa Nakaitaci arrived at Clermont from Nadroga in 2010 and now he's not only a valued first team squad member but in June raced in for two tries on his France debut in the midweek match against the Blues at North Harbour. He's still just 23. Sunday evening was a forgettable one for Clermont as they suffered their second defeat of the season at Stade Francais. Worth making a note of, though, was the debut of another Nadroga graduate, 21-year-old Uwa Tawalo. Talent in its rawest form yet certainly one for the future. Back, though, to that Toulouse hammering for my final observation and another "one to follow". The first Montpellier try was scored by scrum-half Jonathan Pelissie. He picked the ball up more than 40 metres out from the Toulouse try line, sniped around the fringes of the ruck wrong-footing Thierry Dusautoir in the process, and then outpaced two covering defenders (Louis Picamoles and Yann David) before running around Yoann Huget on his way to the line. It was the embarrassment he caused Huget that was most impressive with the France wing/fullback having shown Pelissie the space in which to run before, in his own mind at least, cutting him off with a tackle. Unfortunately for Huget, he'd underestimated the speed of Pelissie's "wheels". In keeping with French half-back traditions Pelissie can play at either 9 or 10. He's not a youngster at 27 and now playing for his third Top 14 club. He made his debut in the competition six years ago for Brive but never broke through there making just a handful of appearances over two seasons. Fast forward to 2011-12 where he played a part in Grenoble's promotion season but then lost his place this time last year to Valentin Courrent as they embarked on their first season back in the top flight. At around the same time Grenoble became aware of Pelissie's plan to move on in the summer and he became a largely peripheral figure. Pelissie's career is blossoming now with more performances like Sunday's likely to attract the attention of not only Huget and his eight Toulouse team-mates set for Marcoussis but also the man who picked them to go there too.